Is It Constitutional to Pray in ‘Jesus’ Name’? Commissioners from Forsyth County in North Carolina appeared before the U.S. Court of Appeals for the 4th Circuit to appeal a District Court’s decision to bar commissioners from opening public meetings with prayers prayed in Jesus’ name. The ACLU and Americans United for Separation of Church and State argued (naturally) that sectarian prayers to any deity violate the First Amendment. The First Amendment offers no such prohibition since it only restricts “Congress” from making any law “respecting an establishment of religion or prohibiting the free exercise thereof. . .” There is no prohibition directed at the states and their counties. In fact, the Bill of Rights was added to the Constitution at the insistence of the states in order to protect them from federal encroachment. Both the language of the First Amendment and examples of state constitutions support this claim. Judge James Harvie Wilkinson III in the Fourth Circuit Court of Appeals majority opinion argued that “legislative invocations offered in Jesus’ name are inherently ‘sectarian’ and thus should be censored lest they make some attendees feel ‘uncomfortable, unwelcome and unwilling to participate in … public affairs.’” But are they unconstitutional? If history is any guide, they are not. 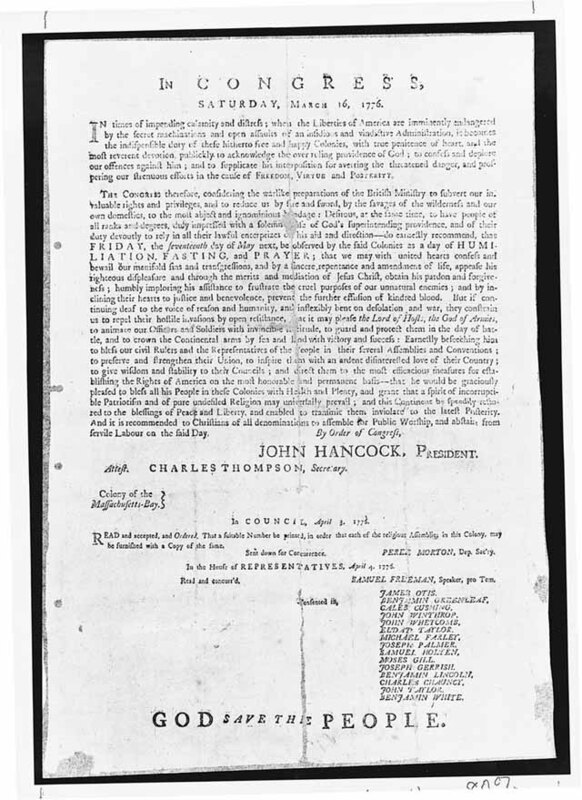 Article XIX of North Carolina’s 1776 Constitution reads, “All men have a natural and unalienable right to worship God according to the dictates of their own consciences.” Article XXXII is specifically Christian in stating the following qualifications for public officers in the state: “No person who shall deny the being of God, or the truth of the Protestant religion, or the divine authority of the Old or New Testaments, or who shall hold religious principles incompatible with the freedom and safety of the State, shall be capable of holding any office or place of trust or profit in the civil department within this State.” This provision remained in force until 1835 when it was amended by changing the word “Protestant” to “Christian,” and as so amended remained in force until the Constitution of 1868 where North Carolina is described as a “Christian State” (Art. XI, sec. 7). Notice the dates. The religious qualifications are specifically Christian and appear after the ratification of the national Constitution in 1791. The above arguments are lost on today’s courts, and most Americans are unaware of our nation’s Christian history. But there might be a way of fighting this battle without having to resort to a long drawn out court battle. The simple solution is for any Christian who is called on to open a meeting with prayer to end it with these simple words: “We make this prayer in the Year of our Lord Jesus Christ 2011,” or whatever the year is at the time. If someone objects, pull out a copy of the Constitution and show them that you are only following what the Constitution itself acknowledges. “The Year of our Lord” is part of the Constitution. You can read it just above George Washington’s signature. This is an obvious reference to Jesus because of the use of “Lord” and the dating from the time of Jesus’ birth which is also part of the Constitution: “one thousand, seven hundred and eighty seven.” This date only has significance in relation to the birth of Jesus Christ. There are other examples in America’s history of using Jesus’ name in official government documents. 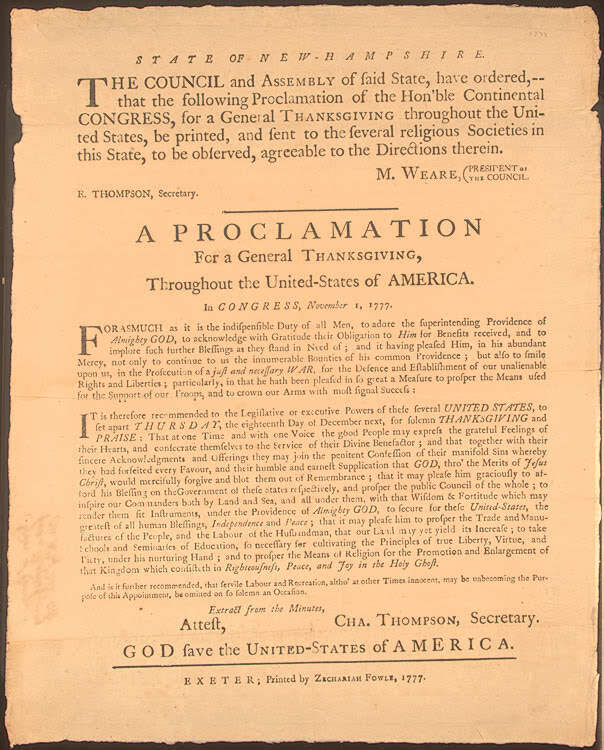 On March 16, 1776, “by order of Congress” a “day of Humiliation, Fasting and Prayer” where people of the nation were called on to “acknowledge the over ruling providence of God” and bewail their “manifold sins and transgressions, and, by a sincere repentance and amendment of life, appease his righteous displeasure, and, through the merits and mediation of Jesus Christ, obtain his pardon and forgiveness” (see here). Congress set aside December 18, 1777 as a day of thanksgiving so the American people “may express the grateful feelings of their hearts and consecrate themselves to the service of their divine benefactor”1 and on which they might “join the penitent confession of their manifold sins . . . that it may please God, through the merits of Jesus Christ, mercifully to forgive and blot them out of remembrance.” Congress also recommended that Americans petition God “to prosper the means of religion for the promotion and enlargement of that kingdom which consists in righteousness, peace and joy in the Holy Ghost” (see here). In consideration of the many undeserved Blessings conferred upon us by GOD, the Father of all Mercies; it becomes us not only in our private and usual devotion, to express our obligations to Him, as well as our dependence upon Him; but also specially to set a part a Day to be employed for this great and important Purpose. . . . And above all, not only to continue to us the enjoyment of our civil Rights and Liberties; but the great and most important Blessing, the Gospel of Jesus Christ: And together with our cordial acknowledgments, I do earnestly recommend, that we may join the penitent confession of our Sins, and implore the further continuance of the Divine Protection, and Blessings of Heaven upon this People; especially that He would be graciously pleased to direct, and prosper the Administration of the Federal Government, and of this, and the other States in the Union — to afford Him further Smiles on our Agriculture and Fisheries, Commerce and Manufactures — To prosper our University and all Seminaries of Learning — To bless the virtuously struggling for the Rights of Men—so that universal Happiness may be Allies of the United States, and to afford his Almighty Aid to all People, who are established in the World; that all may bow to the Scepter of our LORD JESUS CHRIST, and the whole Earth be filled with his Glory. Above Hancock’s signature, the following is found: “Given at the Council-Chamber, in Boston, the fifth Day of October, in the Year of our Lord, One Thousand Seven Hundred and Ninety-One, and in the sixteenth Year of the Independence of the United States of America. If Jesus is good enough for the Constitution, Thomas Jefferson, and John Hancock, then I don’t see why it’s not good for Forsyth County North Carolina.